Ron Leflore’s life story including his journey to the major leagues is truly One in a Million1. Defying apparently insurmountable odds — including never having played organized baseball — LeFlore rose above a disadvantaged childhood, the rough streets of the east side of Detroit, and a more than three-year stint in the State Prison of Southern Michigan at Jackson to become a major league All-Star. Sadly, LeFlore could never entirely disentangle himself from the vices of his troubled youth, which ultimately led to his premature departure from the majors. Ronald LeFlore was born on June 16, 1948 in Detroit, Michigan to John and Georgia LeFlore.2 He was the third of four sons born to the couple. John LeFlore was a native of Mississippi who moved to Memphis, Tennessee as a child. It was there that he met LeFlore’s mother, Georgia. The couple lived in Memphis until 1943 when they followed the call of opportunity and migrated north to Detroit. John initially found a job in an auto factory. However, he battled alcoholism and had trouble holding down a steady job. Georgia worked as a nurse’s aid and is credited with holding the family together. Ron’s crimes became increasingly more brazen and serious as he got older. As a teenager he spent 19 months in state reform schools, but the experience did little to set him straight. On a cold January night in 1970 he and two accomplices, all of whom were coming down from a heroin high the night before, decided to rob Dee’s, a neighborhood bar across the street from Chrysler’s Mack Avenue Stamping Plant. LeFlore carried the rifle used in the crime, and his subsequent conviction led to a five-to-fifteen-year sentence for armed robbery. LeFlore entered Jackson State Prison on April 28, 1970. His first year in prison included long stays in solitary confinement as he resisted the change to a more regimented environment, rejected work assignments and often challenged authority. The transition was particularly difficult for LeFlore; it was not until later into his incarceration that he began to understand the concept of time off for good behavior. While serving his sentence in Jackson, LeFlore had his first experience with organized baseball. He played baseball there, and according to himself he hit .469 in 1971 and .569 in 1972.4 He also became acquainted with Jimmy Karalla, another inmate who was serving a four-to-twenty year sentence for extortion. Believing LeFlore possessed professional baseball talent, Karalla reached out to longtime friend Jimmy Butsicaris, co-owner of Detroit’s popular Lindell Athletic Club, a bar frequented by Detroit sports celebrities. Butsicaris, a classic saloon-keeper type who knew many people in both high and low places, was a good friend of Tigers manager Billy Martin. In fact, Butsicaris was best man at Martin’s wedding. This intricate, semi-underworld network led to Martin’s visit to Jackson State Prison on May 23, 1973, and LeFlore’s subsequent tryout with the Tigers during a weekend furlough in June. LeFlore was released from prison on July 2, 1973, and immediately signed a contract with the Tigers that paid him a $5,000 bonus and $500 per month for the remainder of the 1973 season. The 25-year old (though his age was then reported as just 21) was assigned to the Clinton (Iowa) Pilots of the Class A Midwest League. Under the tutelage of manager Jim Leyland, LeFlore began his transition from prisoner to professional ballplayer. "When I was told I was going to get him, frankly, I didn’t know what to expect. I presumed you could have all sorts of problems with a kid on parole. Could he cross state lines with the ball club? Did I have to keep him out of bars and pool halls? What happened if a brawl broke out on the field and he piled on? "I was scared at the plate, I’ll admit it… In prison I saw curve balls only once in a great while, but in the minor leagues I saw hundreds of them. Most of them weren’t even good curve balls, but they sure fooled me. I’d be standing at the plate, the pitcher would throw the ball hard and inside, and I’d jump out of the way, thinking it was a fastball. And the umpire would call it a strike." 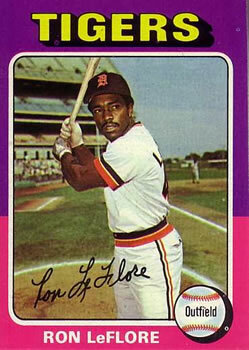 LeFlore started the 1974 season with the Class A Lakeland Tigers of the Florida State League. In 93 games, he batted a team high .339 and swiped 42 bases before being called up to the AAA Evansville Triplets. 7 LeFlore appeared in only nine games with the Tigers’ top farm club, hitting a modest .235 before being summoned up to the parent club because of a season-ending broken hand suffered by the Tigers’ four-time Gold-Glove winning center fielder Mickey Stanley. On August 1, 1974, LeFlore joined the last-place Tigers in Milwaukee and made his major league debut against the Brewers. The Tigers were at the beginning stages of a rebuilding project that involved replacing a long-time nucleus of Tiger outfielders that included Al Kaline, Willie Horton, Jim Northrup, and Stanley. LeFlore started in center field that day and went 0-for-4, with three strikeouts, against Jim Slaton. The next day the rookie center fielder recorded his first major league hit, a ninth-inning single off the Brewers’ Clyde Wright. He also recorded the first two stolen bases of his career. Ten days later, on August 12, he belted his first major league home run, a two-run shot to right field off the Kansas City Royals’ Nelson Briles. LeFlore started 59 of the Tigers’ final 60 games that year and finished with a .260 average, 2 home runs, 13 RBIs and an impressive 23 stolen bases. Defensively he was a huge drop-off from the dependable and steady Stanley. He committed 11 errors and finished with an abysmal .935 fielding percentage. Despite all the raw, natural talent, LeFlore was still just learning the game of baseball. In his autobiography, LeFlore recalled playing his first “real” baseball game on May 18, 1971 when he started in leftfield for the Jackson State Prison team. “I could hit the ball a long way and I could run. Other than that, I didn’t know what I was doing”.8 The strides he made as a ballplayer in Jackson were the result of his natural God-given abilities. Fast forward four short years, and he was now learning the nuances of the game at the major league level. LeFlore’s 1975 season demonstrated just how much more he still had to learn. LeFlore started the season well. At the All-Star break he was hitting .289 with 7 home runs, 28 RBIs and 25 stolen bases. By contrast, the second half of the season saw him mired in a slump that tested his confidence and the patience of the Tiger management. Following the All-Star break he hit a mere .206 with one home run, nine RBIs and 3 stolen bases. On a positive note, LeFlore’s fielding improved significantly. In 134 games in center field, he committed two fewer errors and raised his fielding percentage to .973. The next four years would see LeFlore take his game to a level that no one anticipated in 1975. LeFlore had a breakout year in 1976 even though he was overshadowed by a 21-year old pitching phenom named Mark Fidrych. LeFlore started the year with a career high 30-game hitting streak. From April 17 – May 27 he rapped out 51 hits and batted .392. This happened despite the trauma of his younger brother Gerald’s murder, presumably related to the younger LeFlore’s involvement in drug and gang activity,9 that occurred in the midst of Ron’s career-long streak. On July 13, 1976 LeFlore, together with right fielder Rusty Staub and Fidrych, formed a trio of Tiger All-Stars who started the 1976 Midsummer Classic in Philadelphia. LeFlore led off the game with a single to leftfield off N.L. starter Randy Jones but was immediately erased when Rod Carew bounced into a 4-6-3 double play. In his second plate appearance in the third inning, LeFlore became Jones’ only strikeout victim in the lefthander’s three scoreless innings of work. The National League All-Stars routed the American Leaguers, 7-1. LeFlore continued to hit well after the All-Star break until he suffered a ruptured tendon in his right knee on September 12, ending his season abruptly. In 135 games he finished with a .316 batting average and 58 stolen bases, good enough for second among American League base stealers. LeFlore enjoyed another fine season in 1978. While his batting average dipped to .299, he led the American League in both runs scored (126) and stolen bases (68) while driving in a career high 62 runs. On August 11 he hit an infield single off Britt Burns in the top of the third inning to start a 27-game hit streak. The hit streak allowed him to join Ty Cobb as the only Tiger with multiple hit streaks of 25 games or more.11 Again he was recognized with the Tiger of the Year Award, the first back-to-back winner since Denny McLain’s back-to-back Cy Young Award seasons of 1968 and 1969. LeFlore had another All-Star caliber year in 1979. In 148 games he hit .300, eclipsed the 100-run plateau for the third consecutive season (110) and stole 78 bases, second only to the Kansas City Royals’ Willie Wilson’s 83. On the surface it appeared that the 31-year old LeFlore had established himself as a mainstay in the Tigers’ lineup. However, the winds of change were blowing through Detroit. Fifty-three games into the ’79 season, the Tigers hired Sparky Anderson to replace Les Moss, who less than a year earlier had been hired by the Tigers to succeed veteran skipper Ralph Houk. Houk had managed the Tigers from 1974-78 and overseen the early years of the Tigers’ rebuilding efforts. Shortly into his tenure, Anderson realized that LeFlore was not going to fit into his clubhouse. By this time LeFlore had started to enjoy the trappings of baseball super-stardom, and he flaunted it off the field. There was a drug problem, there were lots of women and shady characters, some of whom were coming in and out of the Tiger clubhouse.12 The Tigers decided that Ron’s career was headed in the wrong direction. True to Anderson’s “my way or the highway” management style, on December 7, 1979 the Tigers traded LeFlore to the Montreal Expos for left-handed pitcher Dan Schatzeder. On the surface the deal looked lopsided in favor of the Expos. LeFlore was in the prime of his career, coming off a remarkable four-year stretch that established him as one of the premier base stealers in the game. Schatzeder, on the other hand, was a promising 25-year old lefthander who had just enjoyed what turned out to be the best year of his career. He had finished 1979 with a 10-5 record and 2.83 ERA. But two years later the Tigers would trade Schatzeder, along with Mike Chris, to San Francisco for Larry Herndon, who became a key piece of the 1984 World Champion Tigers. Though caught off guard by the move, LeFlore enjoyed his new surroundings and declared 1980 “the greatest year of my career.”13 Though his batting average dropped to .257, 40 points below his career average, LeFlore stole 97 bases to lead the National League in the process becoming the first player in major league history to lead both leagues in stolen bases. It was also the closest LeFlore would come to experiencing post-season baseball at the major league level. The Expos finished 90-72, a single game behind the N.L. East-winning and eventual World Series champion Philadelphia Phillies. By this time it was clear that LeFlore was burning the candle at both ends. There were allegations that he was snorting cocaine and shooting heroin frequently.14 His reckless behavior was having an adverse impact on other young impressionable players, a fact that the Expos’ top brass did not fail to see. As a result, the Expos allowed LeFlore to leave via free agency after just one season. On November 26, 1980, LeFlore signed a multi-year, $9 million contract with the Chicago White Sox.15 But his stint with the Sox was plagued by erratic behavior, disputes with management and, at the end of the 1982 season, an arrest for drug and gun possession.16 In two seasons with the Sox he had played a combined 173 games and hit just .267 with 64 stolen bases. Battling a drug problem, a poor attitude, and diminishing skills, LeFlore was released on April 2, 1983. Just two months shy of his 35th birthday, his nine-year major league career was over. Following his release by the White Sox, LeFlore desperately tried to find work with a major league team in some capacity. In 1988 while working as a baggage handler for Eastern Airlines, LeFlore attended former MLB umpire Joe Brinkman’s umpiring school. The five-week course placed top graduates into open minor-league umpiring assignments. LeFlore failed to finish high enough in his class to qualify for a job. LeFlore enjoyed one last opportunity to return to the field when he joined many MLB stars of the 1970s and 1980s to play in the Senior Professional Baseball League (SPBA). 17 He played for both the St. Petersburg Pelicans and Bradenton Explorers during the league’s inaugural 1989-90 season. LeFlore batted .362 with the Pelicans and .317 with the Explorers, finishing the year with a combined .328 average with one home run and 21 RBI. In 1990, he played for the Florida Tropics before the league disbanded. In addition to his inability to find a position within major league baseball, LeFlore has faced numerous other challenges following his playing career. He lost a 49-day-old child to Sudden Infant Death Syndrome, faced felony charges for possession of a controlled substance and was arrested twice for non-payment of child support – once during ceremonies celebrating the final game at Tiger Stadium in 1999. In the summer of 2011, LeFlore lost his right leg to arterial vascular disease, the result of a lifetime of smoking.19 In his autobiography, LeFlore claimed to have started smoking at the age of nine. "I really needed guidance and I didn’t get that. How come I couldn’t have gotten that guidance when I first came up? But I just didn’t have the guidance that I should have had. I had no support from anybody. I don’t know if they were afraid, because I was an ex-inmate, but nobody ever went out of their way to really help me. And I needed somebody. I really did. I really needed some help and some guidance, considering where I came from. And I didn’t get it. "Just think if I had played baseball as a kid instead of running the streets. Just think if I had improved my baseball skills instead of going to prison. How good could I have been? For four brief years (1976-79) in Detroit, LeFlore was able to overcome nearly insurmountable odds and compile the Hall of Fame statistics he thought he was capable of achieving. Over that four-year span, LeFlore hit .310, stole 243 bases and scored 429 runs, demonstrating just how remarkably gifted he was and how improbable his journey to baseball stardom had been. 1 One in a Million: The Ron LeFlore Story was the 1978 made-for-TV movie that chronicled LeFlore’s journey from the streets of Detroit to Major League Baseball. 2 For years LeFlore claimed to be years younger, citing his birthdate as June 16, 1952 and later June 16, 1950. 3 Ron LeFlore and Jim Hawkins, Breakout: From Prison to the Big Leagues (New York: Warner Books, 1978), 33. 7 LeFlore was named the Florida State League’s MVP for the 1974 season. 8 LeFlore and Hawkins, op. cit., p. 80. 9 The LeFlore family experienced a great deal of tragedy. In 1961, Harry, Ron’s older brother, died as injuries he sustained in the ring in his third professional bout as a lightweight boxer. 13 Jim Hawkins, "Former Montreal Expos Star Down but Not Out: Went from Convict to MLB Player to Losing his Leg," The Toronto Sun, February 23, 2013. 17 The Senior Professional Baseball Association, referred to commonly as the Senior League, was a winter baseball league based in Florida for players age 35 and over with a minimum age of 32 for catchers. The league started play in 1989 and disbanded in 1990. 18 Jeff Pearlman, "The Forgotten All-Star," Sports Illustrated, April 17, 2009. Retrieved from http://www.si.com/more-sports/2009/04/17/leflore.